Boo's Mansion is the home of some Boos in Paper Mario. Lady Bow and Bootler live here, as well as many other Boos. Mario needs to go through Forever Forest to get here. Down the road from Boo's Mansion is a windmill, Gusty Gulch, and Tubba Blubba's Castle. The mansion consists of puzzles and traps that Mario must solve and get through to even greet Lady Bow. It has three floors. In Paper Mario: The Thousand-Year Door, Boo's Mansion (though referred to only as "the mansion") is briefly mentioned by Bow, who appears (alongside Bootler) at Poshley Heights after the game is beaten. Apparently, it was a prolonged amount of time spent at the mansion that inspired Bow to take her vacation to Poshley Heights. The concept of a mansion haunted by ghosts and filled with puzzles has been used in other Mario games as well, most notably Super Mario World and Luigi's Mansion. Also, the Ghost House featured in Dance Dance Revolution: Mario Mix looks extremely similar to Boo's Mansion, including similar Boo portraits and chandeliers. Once Mario reaches Lady Bow's room on the third floor, he will be greeted by Lady Bow and her servant, Bootler. They explain to Mario that the Boos are under attack from Tubba Blubba. Bow wants Mario to defeat Tubba Blubba for them, and promises to give him Skolar, the Star Spirit Mario is trying to save, as a reward. Lady Bow also says that Mario needs her help to defeat Tubba Blubba, and after an argument with Bootler, joins Mario's party. Bootler continues to worry about Lady Bow's safety and remains waiting for her return in the third-floor room. The two then set off for Tubba Blubba's Castle. 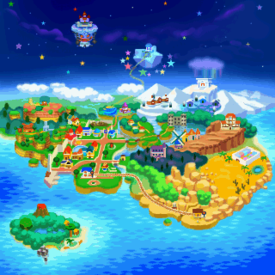 It is revealed that Lady Bow has set the puzzles to test whether Mario could live up to his reputation. She has also ordered that Igor, the Boo merchant in the basement, not sell any item to Mario. After Lady Bow joins Mario's party, Igor's shop will be open for Mario. Franky also appears in the lobby, telling Mario that he can use the shop before setting off to fight Tubba Blubba. The rest of Chapter 3 takes place in the area beyond the back gate of Boo's Mansion. Upon the liberation of the Boos, the background music in Boo's Mansion is replaced with a cheerful tune. Once Tubba Blubba is exterminated, Lady Bow decides to stay with Mario as well as handing Skolar over as promised. At the end of the game, Lady Bow returns to Boo's Mansion after her adventure with Mario, and receives an invitation letter to Princess Peach's party. Boos in the mansion are crazy for Lady Bow. One of them even scribbles on the Toad Town notice board to confess their love for Bow as well as coming to the party at Peach's Castle just to see Bow in her finery. At one point, the Boos in Gusty Gulch write an admiration letter to Bow, greeting "everyone at Boo's Mansion". One of Koopa Koot's favors and Parakarry's letter delivery sidequest involve interacting with Franky in the mansion. There is a pipe outside the mansion that links to (and must be unlocked from) Toad Town Tunnels. Boo's Mansion is located at a branch in the northwest of Forever Forest. It is a big, haunted house with many windows. According to a Boo, the mansion is passed down through the years by Lady Bow's ancestors. The clearing in front of the mansion connects to Forever Forest via the fence and Gusty Gulch via the back gate. The latter is open after Lady Bow joins Mario's party. In the clearing, there is a ? Block containing a Volt Shroom and a bush growing Strange Leaves. There is also a pipe from Toad Town Tunnels, which can be unlocked later in the game. Finally, by the front side of the mansion are a Save Block and a Heart Block. Inside the mansion, the lobby is a big room that spans three floors, with doors to other rooms in the north. There is a sofa that shoots Mario to the chandelier. An underground Star Piece can be found near the sofa. However, there are only stairs up to the second-floor corridor, at the end of which is an empty frame. According to the frame, Mario must find whatever is missing in it to get to the third floor. It also mentions that this is a test from Lady Bow. The east room on the second floor. The east room on the second floor is almost empty, with three cabinets by the west wall. Mario must check the middle one, and play the guess-who-holds-it game with the Boos that come out. Once he picks the correct Boo, they will give him the Record. The other cabinets are traps. There is also an underground Star Piece at the center of the room. The west room on the second floor contains a phonograph and a treasure chest. A Boo is told to guard the treasure chest by Lady Bow. By playing the Record with the phonograph at the right pace, Mario is able to lure the Boo away and get the Weight inside the treasure chest. The Boo then disappears. The room also has a table and some chairs. The west room on the first floor is blocked by a glass case, which can be moved by attaching the Weight to the chandelier in the lobby. The treasure chest in the room is a trap. Going down the stairs by the left wall leads to a basement room with a clock and an underground Star Piece. To the right of the basement entrance is a library. To the south is a pair of storage rooms. The first storage room has some crates on the ground, one of which contains a Super Shroom. There is a one-way door to the right, leading to the second storage room. The second storage room has a big treasure chest containing the Super Boots. Mario must play the same game with the Boos that come out of the chest to get the boots. Once he gets them, the Boos disappear, and another Boo appears and ready to inform Mario how he can use the boots to get the underground Star Piece in front of him. There are also crates containing a glass of Maple Syrup. To exit the room, Mario must break the wooden plate on the ground with the Super Boots to fall to the area even lower. In this lower area is Boo's Shop run by Igor. The shop remains closed for Mario until Lady Bow joins his party. There are also switches, pressing which will reveal the stairs that lead to the first storage room. This gives Mario a way to go back. Back to the lobby, the east room on the first floor has a vase containing an 8-bit easter egg as well as several crates where Apples can be found. By breaking the wooden floor on the ground with the Super Boots, Mario is able to land on the bookshelves in the library room mentioned earlier. On top of the bookshelves is the Boo's Portrait. Mario can also jump from on the bookshelves to the stacked crates nearby and break them, where he can find a Star Piece. Lady Bow, Bootler, and the imprisoned Skolar. The big, royal-looking room on the third floor is where Lady Bow and Bootler live, and where the Star Spirit Skolar is temporarily imprisoned. After Mario solves the puzzles and gets there, he will be greeted by the two. Lady Bow wants Mario to defeat Tubba Blubba and promises to free Skolar if he does so. She also says that Mario needs her help and joins Mario's party. Bootler intends to follow and protect Bow, but Bow insists that he waits here for her return, which he does. Mario and Lady Bow then leave Boo's Mansion and set off for Tubba Blubba's Castle. After Tubba Blubba is defeated near Windy Mill, Bootler goes there and hands Skolar over to Mario. But in other times, Bootler is seen in the room, worrying about Lady Bow's safety and waiting for her return. The room is seen again at the end of the game, this time with Bootler giving Lady Bow an invitation letter to the party at Peach's Castle. Star Piece Under a hidden panel near the sofa on the first floor. Under a hidden panel in the center of the right room on the second floor. Under a hidden panel in front of the clock in the room below the left room on the first floor. In the underneath crate in the room below the right room on the first floor. Under a hidden panel in the west of the room with Super Boots. Given by Igor after giving him a letter from Lavalava Island. Letter Given by Franky after giving him a letter from Little Mouser. Old Photo Given by Franky while doing Koopa Koot's thirteenth favor. Record Held by the Boos in the cabinet in the right room on the second floor. Weight In a chest box guarded by a Boo in the left room on the second floor (play the Record to lure the Boo away). Boo's Portrait At the northeastern corner of the room below the right room on the first floor (requires Parakarry). Volt Shroom In a question block in front of the gate. Strange Leaf In a bush near the backyard gate (replenish-able resource). Apple In a crate in the right room on the first floor (replenishable resource). In another crate in the right room on the first floor (replenishable resource). Super Shroom In a crate in the room south to the room below the left room on the first floor. Maple Syrup In the underneath crate in the room with Super Boots. It's Boo's Mansion. Great name for a haunted house, don't you think? What a magnificent mansion! Being haunted must hurt the real estate value, though. I like the old-fashioned yet eerie style. The chandelier and the display case look like they're valuable antiques. Even the sofa in the foyer looks like it's pricey, even though it's a bit worn. I love antiques. I wouldn't mind taking a good look at those things. Wow! What a gorgeous chandelier! If they actually cleaned it, it would brighten this place up. Hey, that strange contraption at the back of the room is a phonograph. You know, a machine for listening to records. Have you seen any records around here? I wouldn't mind doing a little adventuring to the timeless classic, "Mario's Theme"! The blue light is spooky in here, but you can tell that this room is really nice. It feels like something is watching us. It feels like that everywhere. It's almost as if this haunted mansion is...haunted. A storage room... isn't it? You'd think those candles would provide a bit more light. Another storage room, I guess. Not a whole lot here, as far as I can tell. Hey, incidentally, what happened to the door...? This room does have a lot of space, but it's still a shame to use it for storage. That pot and those wooden boxes look suspicious... There's also a weakened spot on the floor. Look...under the chandelier. Hey, check it out! A real old rocking chair! These things rule! It rocks back and forth when you sit on it. I love napping in these. There certainly seem to be a lot of books. I didn't know Boos liked books. This is the highest room in the mansion. I'm guessing it's Bow's room. She seems like the type to live in a huge room. When you look at this room, it's pretty obvious that Bow was raised by a really wealthy family of Boos. It's a mansion. For Boos, of course. Watch out for tricks! Lots of Boos live here. There's a shop in the basement. The first time Mario opens a door, a big Boo appears. Boos throwing the Record in the room. The room with the Super Boots. Boo's Shop run by Igor. Mario receives a Star Piece from Igor. Bow and Bootler talking to Mario. The right room on the first floor contains a vase. If Mario is to jump into this vase, he will pop back out as an 8-bit sprite. This lasts until Mario jumps back into the vase or leaves the room, and it is worthy of note that playable 8-bit characters are somewhat of a running joke in Mario RPGs, having additionally been featured in Paper Mario: The Thousand-Year Door, Super Paper Mario and Super Mario RPG: Legend of the Seven Stars (which predates Paper Mario). However unlike Super Mario RPG in which it could only be performed once, in Paper Mario 8-bit Mario trick is repeatable. ↑ Game dialogue: "This mansion has been passed down through the years by Lady Bow's ancestors. It's so comfortable... So nice and gloomy... The dirt on the walls... The splintered floorboards... It's really one of a kind." ~ A Boo on the second-floor corridor. This page was last edited on July 23, 2018, at 18:20.